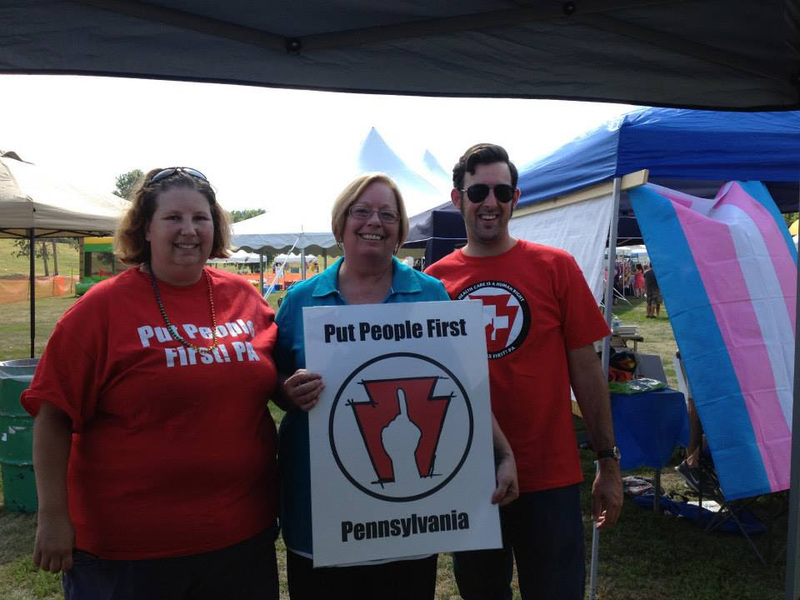 Join the PPF Statewide Membership Call Thursday September 4th at 7 pm. Hear the voices of other members from around the state. Find out more details about the upcoming Membership Assembly. Share what’s going on where you are! Reserve your seat – “Mercy Killers” is coming to York, PA! Put People First presents the acclaimed play Mercy Killers for one night only in York, Saturday August 30 at 7 pm! Mercy Killers has been called a “raw, topical piece that shows the collision of ideas and reality in a system where health and well-being go up against profits. It is a show that is very much of the zeitgeist.” The show is being offered at a sliding scale admission, made possible by partners like the International Brotherhood of Maintenance of Way Employees and the Unitarian Universalist Congregation of York. Put People First! PA Organizing Committees launching across the state. Put People First! PA is growing quickly. Last week members in Harrisburg came together for their first Organizing Committee meeting. OC’s in Wilkes-Barre, Scranton, Schuylkill County and Philly will begin meeting soon, too.